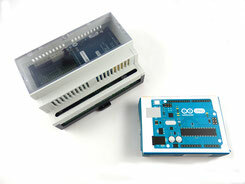 Our ArduiBox Open and RasPiBox Open din rail housings for Arduino and Raspberry pi comes now with a transparent top shell. It makes the usage of LED and LCDs easier. You want the older closed top shell? No problem - we can deliver it on request.